The new Streatham base of the Living Well Network Hub was visited by two Government ministers earlier this week. The Community Options Team – managed by Thames Reach and consisting of voluntary sector providers including Certitude, Look Ahead, Mosaic and Penrose. · The Primary Care Support Service – a group of nurses working with Clapham Family Practice in GP surgeries. · A peer support service hosted by Certitude. 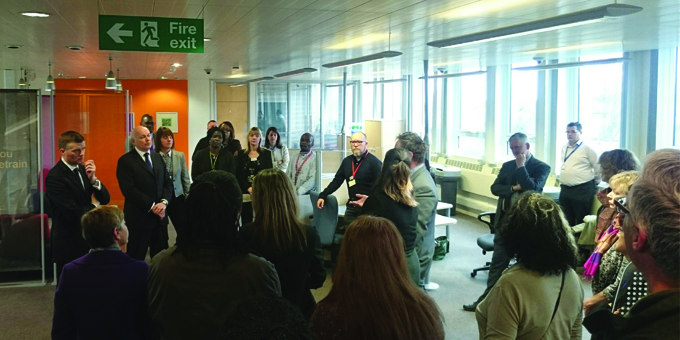 The Secretary of State took time to talk to staff from the hub about how the service worked and how they thought it could be improved; he also met with service users and heard how their experiences using the hub had changed their lives. Katie Ryan, Lambeth Project Manager with First Step Trust had a chance for a quick chat with the Minister, telling him about the West Norwood garage that is bringing hope and job prospects to service users. One service user who suffered from depression gave a moving account of how Mosaic Clubhouse, (hosts of the Living Well Partnership) which is part of the network, had saved his life. He said that he felt fully supported and that staff were like a family.